We’re not impulse buyers. When we think about what we want to buy, we turn it over and over in our heads, thinking about whether it is worth the money, would we use it, do we need it…probably in an effort to reduce that horrible feeling of buyer’s remorse. Where you bought something on a whim, thinking that you needed it in your life and then hating it when you looked at it at home. It’s the feeling of hassle – “now I’ll have to go all the way back and explain why I don’t want it anymore or if I can’t, try to find someone who wants it”. Then maybe you do actually take it back or find a home for it – or maybe you send it to some dusty cupboard or storage box (if you’re one of the lucky few in London who actually has space in their apartment) and won’t look it again until you do a big clear-out. In which case, the feelings of buyer’s remorse will wash over you all over again. Oh the drama! We’re not impulse buyers. Life is too short to have to deal with the fallout. As you know, we have this obsession with trying new ingredients we have never tried before, and not just when we travel. We just can’t help it – what’s that strange looking Korean hot sauce? What do you do with crystal noodles? What does Polish sausage taste like? Maybe it’s our generation’s version of FOMO (Fear Of Missing Out) – we want to make sure we try as many new things as possible. Maybe it’s just plain curiosity. And now that we’re in the Christmas season – we randomly picked up a can of Crème de Marrons and threw it into our shopping basket. Just like that. No necessity assessment, no consideration of the price or what French chestnut puree would even taste like. Luckily for us, the moment we opened it up we realised that not only did we like the taste, but it reminded us of something we have all the time – dates! What could be more Christmassy than dates? And being chocaholics we wanted to immediate pair it with chocolate. Does anyone else have that urge? 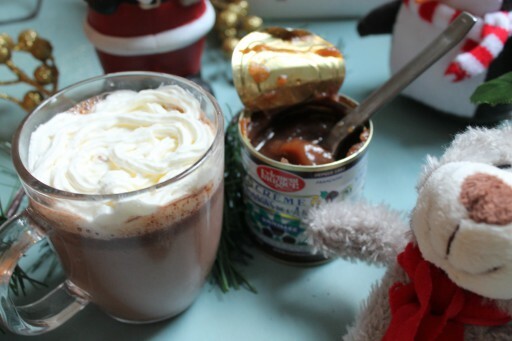 Whatever the food, we immediately think of dipping in chocolate. 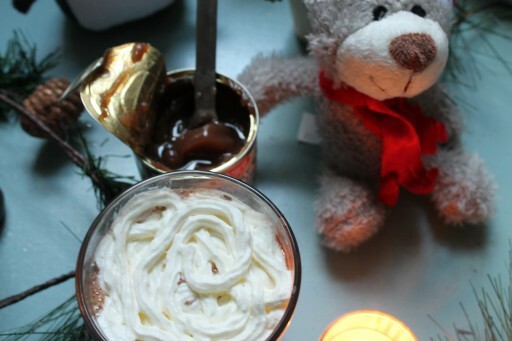 So on a whim, we added it to our hot chocolate and it was the most luxurious hot chocolate we have ever tasted. The chestnut puree really adds a depth of flavour that you can’t really put your finger on. You just know that you want to keep drinking it. We still have some left, watch this space to see what else we do with our new discovery! Pour the milk into a milk pan and heat on medium heat. Add the chopped chocolate and stir as it melts into the hot milk. When the chocolate is dissolved, add the cinnamon and chestnut puree. Stir until full dissolved. Take the pan off the heat and pour into a mug. Absolutely lovely! We just wrote a post on marron glacés as well, including a recipe also. We are a French Cooking and Baking School in Paris and we just started our very own blog. I’d like to invite you to check us out sometime 😉 Also, if you’re ever in town, please do come by, à bientôt! It honestly is! It’s very rich!